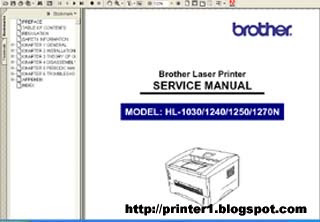 This service manual contains basic information required for after-sales service of the laser printer (hereinafter referred to as "this machine" or "the printer"). This information is vital to the service technician to maintain the high printing quality and performance of the printer. Installation conditions, Installation procedures, basic operation of the printer etc. Basic operation of the mechanical system, the electrical system and the electrical circuits and their timing information. Reference values and adjustments, troubleshooting image defects, troubleshooting malfunctions, etc. APPENDICES : Serial No. descriptions, Drum life & page counter, Diameter / circumference of rollers, Connection diagrams, PCB circuit diagrams, etc. 1 Response to "BROTHER HL-1030 HL-1240 HL-1250 HL-1270N SERVICE MANUAL"
Thanks for the service manual. My printer is old and I need the manual so much. Obrigado pelo manual. Era o que eu precisava. Bom trabalho.